Preheat a large skillet to medium heat for 3 minutes. Add the bacon and cook until crispy. Move bacon to outer edges of the skillet and add the Mexican chorizo to center of pan. Cook for 5 to 6 minutes. Add the onions and serrano peppers, continue cooking for 3 minutes. Add the garlic and cook for another minute. Add the tomatoes, 1/4 cup of cilantro and cook for 5 minutes. Add the beans, chicken broth, juice of 1 lime, 1 tablespoon liquid smoke, 1/2 teaspoon smoked paprika, 1/2 teaspoon cumin, 1/2 teaspoon oregano and 1/4 teaspoon of pepper. Bring to a boil, reduce the heat and continue cooking for 20 minutes. Taste for salt halfway through the cooking time. Let the beans stand for 10 minutes before serving. Serve with warm corn tortillas. Garnish with avocado, cilantro and lime wedges. If you are cooking beans from scratch, I wouldn’t season with salt until the beans are soft. Adding the salt too soon may cause your beans to harden and they will not cook fully. 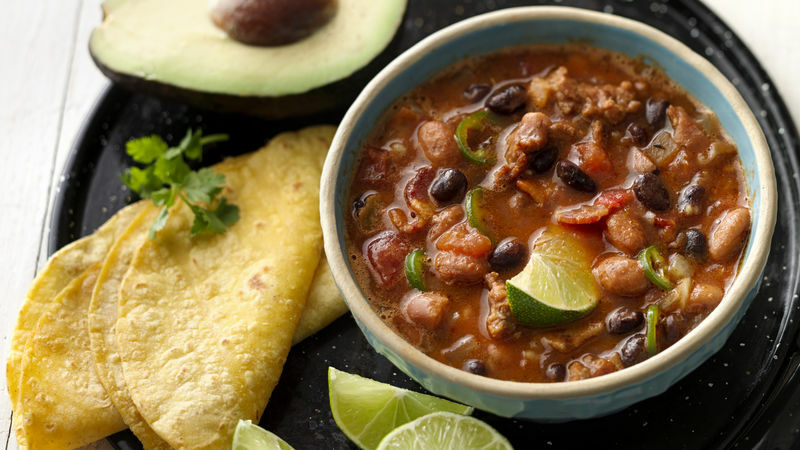 Beans are one of the staple foods in many Hispanic pantries. My Mom would prepare a large pot of beans on Sunday and from that one pot she would make a variety of dishes. On special days when we would grill, frijoles charros were always on the menu. And there is no way you could have carne asada without a hot bowl of frijoles charros. They are the perfect pair. To this day, I still prepare frijoles charros every single time I prepare carne asada. A true Mexican tradition in my familia!